Hotel Overview The town of Promorsko is situated in the Southeast Bulgaria o n the Black Sea coast. The average summer temperatures are 25-27°C. The town is highly endowed with picturesque natural beauty, long golden beaches and a lot of sun. The clean waters of the sea do not bring dangerous streams, fish and animals. The lovers of under-water beauties and ancient finds can watch ancient ruins from 7-6th centuries B.C. of Thracians and Anatolian Greeks. In the region of Primorsko there are situated the nature reserve “Ropotamo”, “Water Lilies”, the preserved areas “Arkoutino”, “Perla” sand dunes, “Stamopalo” marsh -land, The rock formation “Lion Head”, the fiords and the Seal Cave in the rocks of Cape Maslen. The proximity of Standja Mountains determines the possibilities for other kinds of tourism, outings and picnics. The many legends, rituals and ancient archaeological finds in the region are the reasons for archaeological and ethnographic excursions. The preserved wild nature is suitable for observation of nearly extinct plant animal species. 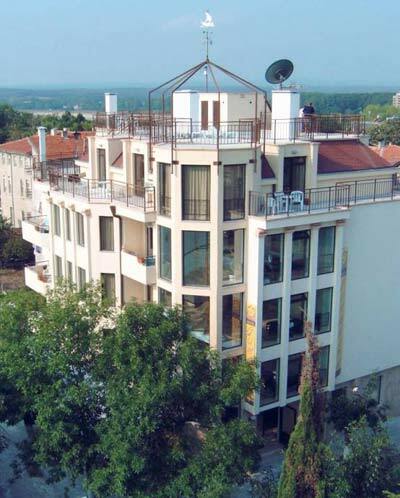 The “Sunarita” hotel is built in a central street of Primorsko, in the vicinity of the church, the cultural centre and the summer cinema. The area is quiet and tranquil. The South beach and the North beach happen to be at an equal distance from the hotel, around 150-200m. that are easily passed by walk. The hotel consists of a semi-basement floor, a ground floor, three standard hotel floors, fourth V.I.P. floor and a terraced scenic floor. The standard hotel floor consists of o ne double room, three double rooms with the possibility to add two additional beds, o ne suite and a maid’s office. All the hotel rooms have a TV set, phone, air-conditioner, a refrigerator and a terrace whit table end chairs. The combination of the comfortable hotel furniture and the colour scheme used create a jolly atmosphere and cosiness. The fourth floor plan includes a double room, two suites and a maid’s and office. For the easier servicing of the hotel floors there is developed a service staircase that connections the maid’s offices with the auxiliary premises situated on the ground and the semi-basement floors. The basic number of hotel beds is 36. If all the possibilities for additional beds are realized the capacity can be 64. On the semi-basement floor there are situated a fitness hall, a sauna, massage hall and a hall which size envisaged service in the open which increases the seats to 70. The restaurant offer a diverse cuisine and sea delicacies. At customer’s request there can be prepared also specific national dishes. The cocktail bar situated on that level is whit a restricted access only for the visitors of the hotel. From the terrace floor there is seen the widest panorama of Primorsko and is a suitable place for sun bathing and cocktails in private. Hotel Address 29 "3rt mart" str. Imam zapitvane po edin vapros svarzan s va6iq xotel.Razvle4eniqta koito predlagate vklu4vat i ezda,mojete li po podrobno da obqsnite za neq.Naprimer Kakvi sa koneteza lubitelska ezda ili za sport,kakvi sa cenite i dali samo pose6tava6tite xotela mogat da qzdqt!Blagodarq za otdelenoto vreme!! !